The Me Too Chair is made to simplify your travels. 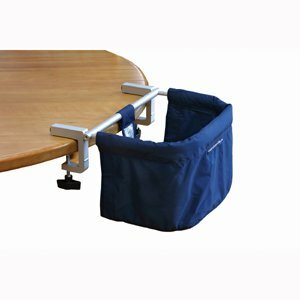 It works with almost any table and folds flat to fit in your diaper bag. This ultra portable high chair takes moments to set up and children love to use it because it allows them to sit up at the table with the rest of the family and really feel as though they are part of the action! Weighing under 2 lbs and accomodating children up to 40 lbs this travel high chair simplifies eating away from home - in fact this is such a great high chair we believe it will be a fixture at home as well! Available in Red, Blue and Black. We've had this chair for a few months now and are thinking of getting another one for when we are out. Our 11mo son loves to sit at the table with us and eat our food/be part of the family. pros- same height at the table, easy to use, good for limited space, compact with easy travel. Blue (we have this one) and Black don't show dirt as much. Have yet to find a table it doesn't work on. We even have a 2" hang that the chair will attach to without being a problem. Wouldn't survive without these chairs! Would be a great chair, if it fit on tables!